Schute Bell Badgery Lumby » Blog Archive » Bourke – Schute Bell Whitbread & Co.
Bourke – Schute Bell Whitbread & Co. Tagged: Bourke, News, Schute Bell | Comments Off on Bourke – Schute Bell Whitbread & Co.
Schute Bell Whitbread & Co. Bourke was formed by the merger of Peter Whitbread & Co. and Schute Bell Badgery Lumby. This followed the passing of Mr Peter Whitbread a very well-known Stock & Station & Real Estate Agent in Bourke who had a strong association with Schute Bell that commenced prior to 1983. 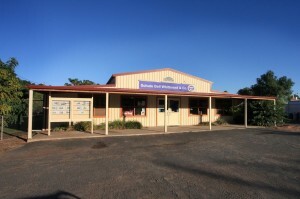 This business is a well renowned business catering for Sheep and Cattle producers in the Western Division of N.S.W. In addition it has an active Town Real Estate and Residential & Commercial Rental business along with traditional Rural Property sale, a competitive merchandise range is available and caters for the livestock producer’s needs. This together with the support of a traditional Wool Broker who has competent skills and various options creates a highly focused business.